Ever since I shared my coffee ice cream pie with whiskey ganache with you guys, I’ve been a little smitten with ice cream pies. They are a fairly impressive dessert with really minimal hands-on effort. Those are my favorite kind of recipes. Easy but looks complicated. Fools everyone and paints the picture that you’re a total champ. Which you are, of course. 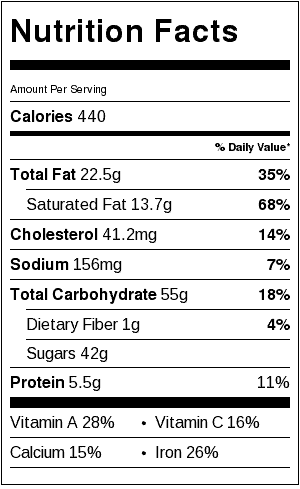 And can I tell you how my kids’ eyes lit up when I told them they could eat some of this pie? They were on cloud 9…and rightfully so! Sprinkles, ice cream, and rice krispies? Oh yeah, kid heaven here. So as I was saying, ice cream pie is really simple to make. 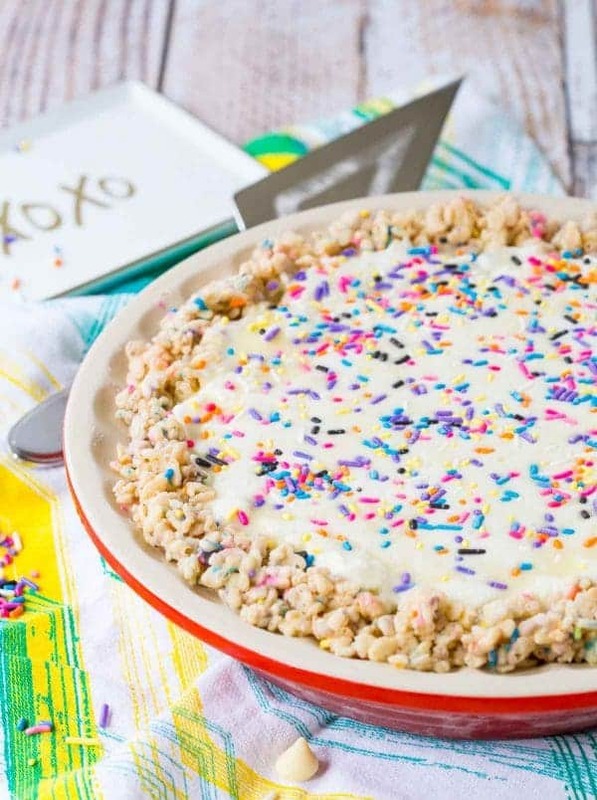 You start with a crust of your choice – this one has rice krispie cereal (or crispy rice cereal if you go with an off-brand) and white chocolate as the crust. And sprinkles! Then of course the ice cream, because without ice cream, it isn’t an ice cream pie recipe. I kept things simple and classy with vanilla bean ice cream. To top off the pie, I would highly recommend some toppings. For this recipe, we used white chocolate ganache and sprinkles. If you’re in a rush and want to keep things simple, you could easily just toss some sprinkles on top and call it a day, but the mixture of heavy cream and chocolate (white, in this case) is always going to kick things up a notch. I love that when you slice this pie, the white chocolate kind of runs down the sides of the slice. I use a super hot knife to slice the pie so it melts right through that ganache and ice cream. Happy summer! 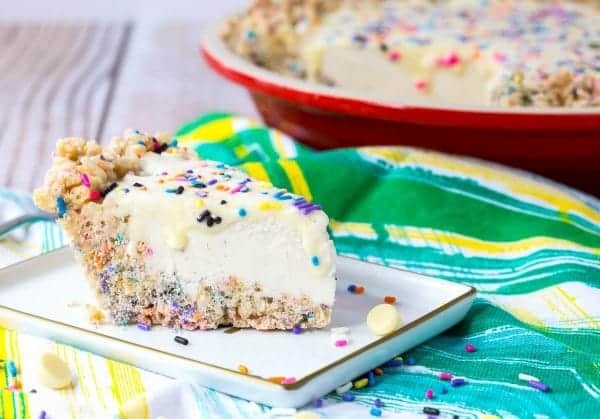 Celebrate these warm days with ice cream pie. Looking for more frozen treats? You can search through my entire ice cream archives or try one of my favorites: Nerds milkshake, coconut hot fudge ice cream, or homemade cookies and cream ice cream. 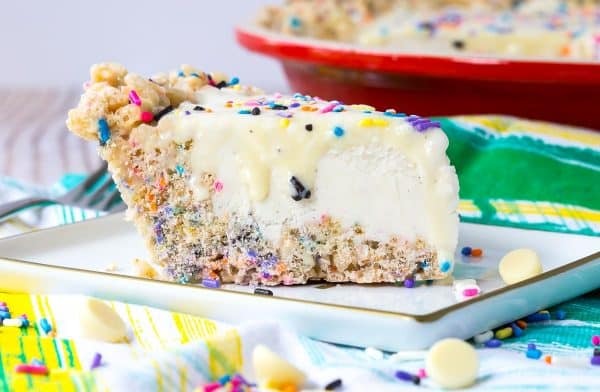 Melt 8 ounces of the white chocolate for the crust in a large heat safe bowl placed over a pan filled with shallow boiling water (double boiler). Melt until smooth, stirring constantly. 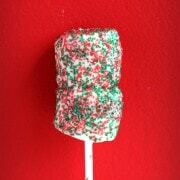 Remove from heat and stir in rice krispie cereal and sprinkles until everything is all coated with white chocolate. Spray a 9- or 10-inch pie pan with nonstick cooking spray and press the rice krispie mixture into the bottom and up the sides of the pan evenly. Don’t press too hard or your crust will become very hard. Freeze crust for 15 minutes. At the same time, take ice cream out of the freezer, and set on counter to soften. 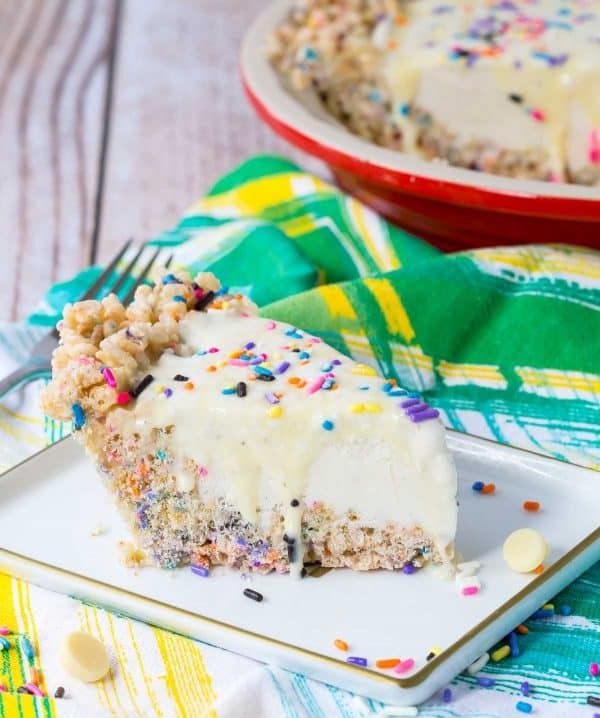 Fill crust with softened ice cream – it should be roughly even with the top of the crust. Smooth out so it is flat. Place in freezer and freeze until nearly solid, 1-2 hours. Meanwhile, heat heavy cream in microwave or on stove until bubbling but not boiling. Pour cream over remaining 3/4 cup of white chocolate and let set for 1 minute before stirring until chocolate is completely melted. Set aside to cool slightly. When ice cream has hardened and ganache has cooled to room temperature, pour the ganache over the ice cream and sprinkle with 1 tablespoon sprinkles. 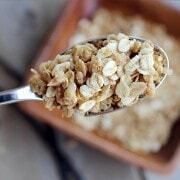 Freeze again until about 15-20 minutes prior to serving. At that time, remove from freezer to let soften slightly for 5-10 minutes before slicing with a very hot knife. 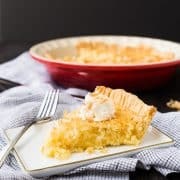 Note: As a host/hostess, you usually serve yourself last but the first slice of this pie doesn’t always come out the greatest, so go ahead and put yourself to the front of the line and save the pretty slices for your guests. Note: Dip your knife in very hot water to help make slicing this pie easier. Verdict: I can only eat a few bite of this pie at a time because white chocolate is personally a little too sweet for me (give me all the dark chocolate!) but if you’re a white chocolate fan with a sweet tooth, you’re gonna love this pie. 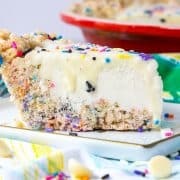 Husband’s take: Ben and the kids loved this ice cream pie recipe. Difficulty: It seems like a lot of steps, but they’re all completely doable. RACHEL. You’ve somehow combined my 3 favorite splurges into one!! Sprinkles, Rice Krispy Treats (I can hardly have these in my house) and ice cream. I could probably put down my chef’s knife and retire from cooking forever after making and eating this pie. This looks just beyond heavenly!